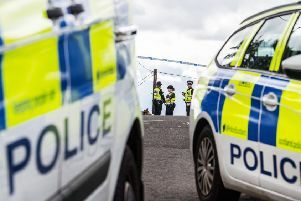 A 40-year-old suffered serious injuries and another man was detained following an altercation in Wotherspoon Drive at about 7.15pm on Tuesday. The 40-year-old victim was taken to Forth Valley Royal Hospital, where he remains in a stable condition. A spokesman for Police Scotland confirmed that a man had been detained. The officer also confirmed that their inquiries are ongoing. Officers were conducting a search of the area when the Journal and Gazette’s photographer arrived on the scene (right). Residents of the quiet Bo’ness housing estate had to manouevre round a number of police cordons this week. And social media was rife with rumour and speculation following the incident.